The Augusta GreenJackets, Class A affiliate of the San Francisco Giants, unveiled logos featuring a fiercer version of their signature bee. The Augusta GreenJackets unveiled new logos Wednesday that are sure to generate a buzz. The GreenJackets' primary logo, like the one it replaces, prominently features a bee. Whereas the previous winged insect was decked out in a literal green jacket -- an homage to the iconic apparel worn by the winner of Augusta's Masters Tournament -- the new one is leaner, meaner and a stricter adherent to the school of sartorial minimalism. He doesn't wear a green jacket; he himself is green. 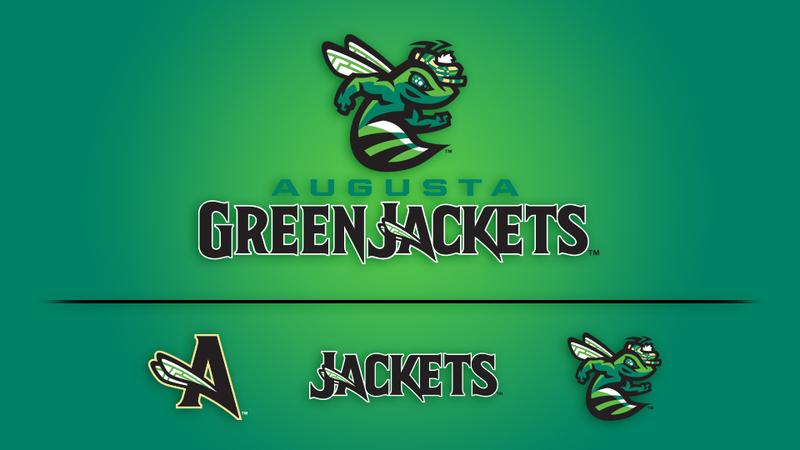 "We went way down the road on a couple of different looks but decided that we need the bug," said Jeff Eiseman, president and partner of the GreenJackets' Agon Sports and Entertainment ownership group. "It all came back to the bug." The GreenJackets, Class A affiliate of the San Francisco Giants, are moving into a new stadium next year. SRP Park, located across the Savannah River in North Augusta, South Carolina, replaces the team's previous home of Lake Olmstead Stadium. SRP Park is part of the Riverside Village at Hammond's Ferry, a "live, work, play" development project that Eiseman describes as having a "neo-colonial new urbanism" aesthetic. "Our current logo didn't fit the motif of this brand-new building and development," he said. "It was important to have a brand that matched the identity of the stadium and what is happening there. ... In updating the bug, we moved away from a lot of the golfing themes. We figured that since the GreenJackets name is going on 30 years old, everybody in Augusta knows what it represents. We didn't need to bang that home with the local community. Nationally, some people might not understand, but they're not our target audience." That said, a golf motif remains. The bee is wearing a duffer's cap, which Eiseman said is a "salute to plaid and maybe making fun of what a Sunday muni golfer might wear on the course." The bug's eyes, meanwhile, feature golf ball-shaped dimples. "We wanted to make the bug a little fierce but not scary," Eiseman said. "Not that the old bug wasn't fun and cute and wonderful, but the orange [in the previous color scheme] was tough to work with. We wanted earthy tones that played well and incorporated light gold instead of orange. We had fat versions of the bug and skinnier ones. Ultimately, we slimmed him down and gave him a bit more of a stinger." The new logo set also features a gold-outlined winged "A" with the wings bracketing the preceding "J" in the GreenJackets name. The new look was designed by Brandiose, a San Diego-based firm known for its irreverent and sometimes polarizing work. "Brandiose does a lot of good work in this marketplace. They get people thinking and talking," Eiseman said. "It's audacious. Sometimes bold and awesome, sometimes controversial. I tend to be more conservative in my approach, so I had to be dragged kicking and screaming to Brandiose. But others [with the team] pushed me to open the door to Brandiose, and I'm glad I had a change of heart." A limited quantity of team merchandise became available upon Wednesday's logo unveiling. Eiseman said that a much larger assortment would be available once the season begins, within SRP Park's spacious team store. A full assortment of uniforms will be unveiled later in the offseason, with Eiseman remarking that the team is going with "more of a classic baseball look, at home and on the road." That classic look is sure to incorporate the golf tournament-referencing insect that has always been associated with the GreenJackets identity because, as Eiseman said, "We just couldn't get rid of the bug."